Piaggio introduced a 3-wheeled scooter 2 years ago, and real bikers looked down on it. They will have an even worse opinion of this one, because it has FOUR wheels. 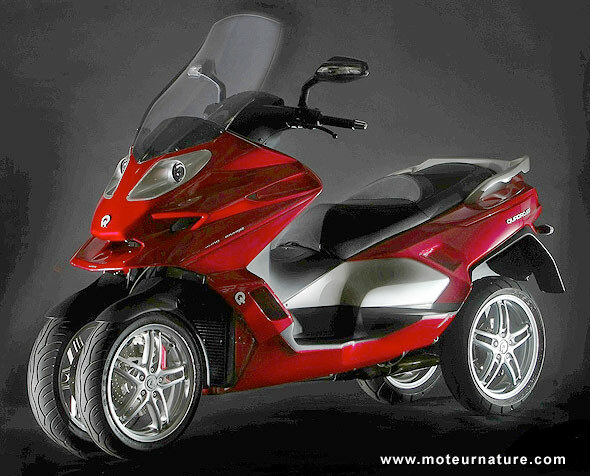 It’s called the Quadro 4D, and it has been introduced yesterday at the motorbike show in Milan. Does it make sense? What’s the use of a scooter with 4-wheels? The answer is in the video below, and guess what, the picture above doesn’t show someone about to fall down. That Quadro 4D is incredibly sure-footed. Coming from Marabese Design Srl, a famous Italian design and engineering company, it will be produced and sold by a new company, Quadro Technologie, which is a spin-off of Marabese Design. 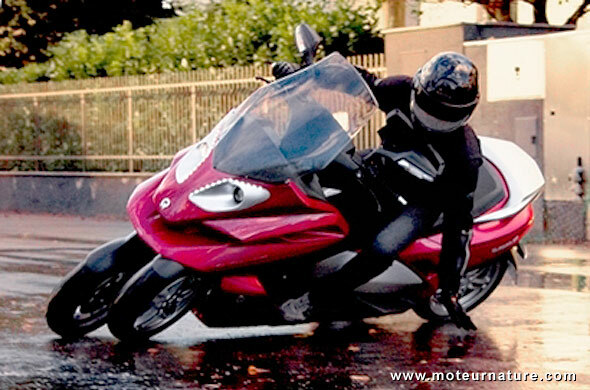 The Quadro 4D is expected in Italy late next year. With a .5 liter 40-hp engine, its price should be a bit above $12,000. Not cheap, but there’s nothing like it. With its hydraulic tilting system (the Italians call it sistema di pendolamento idraulico), the Quadro 4D has unparalleled safety and stability. It could appeal to people who would never consider a motorbike, but a car, while being much more fuel efficient, easier to park and cheaper to run.